Hailing from Philly Tony Vattimo is very active as jazz musician in and around his hometown. He is playing with his band New Earth Trio (featuring bassist Rob Williams and drummer Abe Speller) or at Gerald Veasley's Jazz Base in Reading. He also performs with Andre Neu and his band. Last year He has released his debut album Can't Let Go, on which Tony plays keyboards and piano. He is joined by Erik Johnson (drums), Steve Varner (bass), Kevin Hanson and Steve Zinno (guitars), Bob Howell (sax), Iram Diaz (percussion), Chuck Dressler (trombone), Bill Hicks (trumpet), Dave Di Palma (sax). Tony has composed all songs. He already received high acclaims by notable critics. A reason to present this worthy album to the readers of this column. The city is often inspiring musicians of all genres. Street Lights is Tony's personal contribution to the night life of his hometown. Vattimo portrays the scenery with soft piano notes backed by a veritable horn arrangement. On Farewell Vattimo describes the moment, when you have to leave a beloved person. The melancholic melody is interpreted by Dave Di Palma on soprano sax in a sensitive performance continued by Vattimo with gentle key touches. The happiness and joy of Cruzin is captured in the following song. The swinging piece of music leans to Bossa Nova rhythms evoking associations of foreign countries. In the middle part the tempo accelerates to a piano solo, before the main theme appears again. Undertow is a strong subsurface flow of water returning seaward from shore. Keep this movement in mind, when you listen to this song and you understand how perfectly the title fits to this sequence. When we talk about Images, then remember your last visit in the Prado, Louvre, Ufficien or Pinakothek. Admire the wonderful paintings and listen to Vattimo's equivalent. Steve Zinno, Dave Di Palma and Tony Vattimo track the magic of these places in spellbinders. The dynamic of Na Pali Coast is owed to Steve Varner's bass, but all artists, I already mentioned create a compressed and dense configuration, which cannot be expressed in words. Thanks to Tony the album is not a one-man-show. For example Can't Let Go features guitarist Steve Zinno and Tony shines on Hammond B3. This pleasant instrumental change makes this album so vivid. Tony's musical ideas are obviously borderless. On To New York my surprised ears hear not only the usual instrumentation but also a vocoder. Also very impressive is his elegant approach to the piano comparable with the style of David Benoit or Alex Bugnon. In between he follows interesting tone compositions drawing the attention of the listener. Some of Tony's songs like Don't Look Back tell stories of harmony and desperation, dissonance and peace. On others, I name The Race the group follows Tony's contemporary jazz adventures. With the mellow Open Your Heart Vattimo lowers the sheet anchor and gives fans of smooth jazz more perspectives. 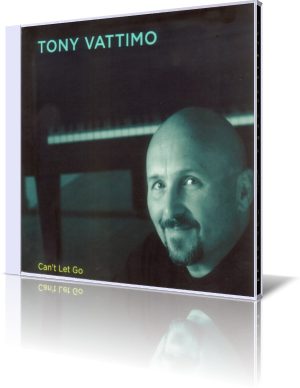 Tony Vattimo delivers with his debut album Can't Let Go an encyclopedia of new musical ideas. Certainly not a nine-day wonder of this creative musician.